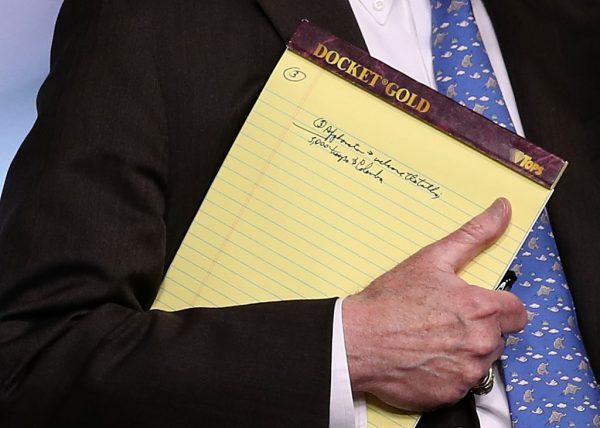 A notepad with the words “5,000 troops to Colombia” scribbled on it has raised questions about potential U.S. military actions in Venezuela, after White House national security adviser John Bolton was pictured holding it at a press briefing Jan. 28. Despite mounting international pressure against socialist dictator Nicolas Maduro’s regime, thousands are still continuing to flee Venezuela into neighboring Colombia. It’s unclear whether Bolton’s notes were a sure indication that the Trump administration was considering sending U.S. troops to Colombia, also uncertain was whether Bolton’s disclosure of the notes was intentional. The Department of Homeland Security did not immediately respond to an emailed request for comment. Both President Donald Trump and Bolton have previously said “all options” are on the table after Washington recognized Venezuelan opposition leader Juan Guaidó as the interim president. The sending of U.S. troops to Colombia could escalate tensions further since Russia repeatedly warned the United States not to intervene militarily in the Latin American country. Pentagon spokesman Col. Rob Manning said the number of U.S. military personnel in Colombia remained unchanged as part of a pre-existing partnership. One U.S. official on condition of anonymity told Reuters they “have seen nothing to support” Bolton’s annotation. 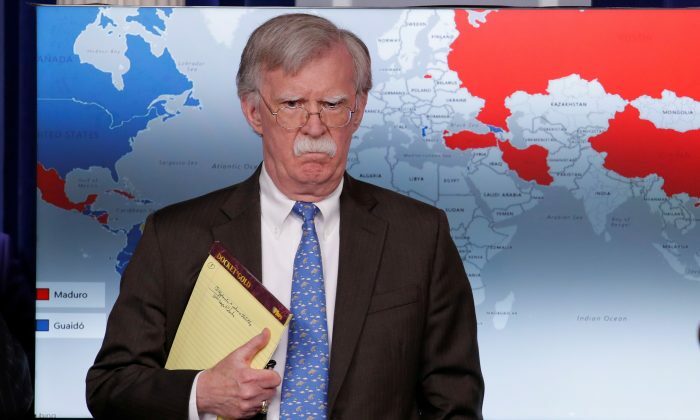 Colombia’s Foreign Minister Carlos Holmes Trujillo, in a Jan. 28 statement, said: “We are not aware of the significance or the reason” for Bolton’s notes. In the meantime, the U.S. Department of State Travel issued a level 4 travel advisory to Venezuela on Jan. 29, due to crime, civil unrest, poor health infrastructure, and arbitrary detention of U.S. citizens. On Jan. 24, the Department ordered the departures of non-emergency U.S. government employees and family members. The economic sanctions were the latest step from the United States to pressure Maduro to step down. Russia and China have invested heavily in the oil-rich country for years through loans and energy deals. Tensions between the two countries appeared to lessen somewhat after Maduro’s regime suspended its demand that U.S. diplomats leave the country within 72 hours late on Jan. 26. The Trump administration had refused Maduro’s Jan. 23 order, arguing the dictator had no legal authority. In a statement, Venezuela’s Foreign Ministry said they would provide a 30-day window for negotiating with U.S. officials about setting up a “U.S. interests office” in Venezuela and a similar Venezuelan office in the United States. Washington also accepted Guaidó’s designation of Carlos Alfredo Vecchio as the chargé d’affaires on Jan. 25. He will serve as the representative of the government of Venezuela to the United States. Guaidó again called for Venezuelans to take to the streets on Jan. 27 in order to put pressure on Maduro and his presidency, which is widely perceived as illegitimate. The 35-year-old has called for democratic elections free from corruption. Socialist policies introduced by Maduro and his predecessor, Hugo Chavez, have crippled the nation’s economy and driven millions out.